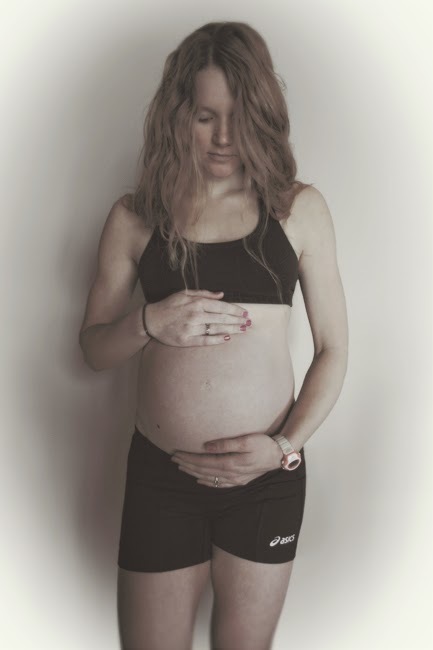 I was doing well with training until I hit about 8 months of pregnancy. I just finished the 50x50 sprint swim challenge, and we were taking a trip down to Madison. I hadn’t been sleeping well the past month and it was catching up to me. I came down sick and what was supposed to be a fun “getaway” to Madison ended up being a bit miserable: fever, aches, chills, terrible heartburn, cough (that respiratory junk that’s in your lungs and you can’t get rid of), sore throat, etc. While I never actually threw up, I did a little in my mouth while on a run – but that was from the heartburn – a terrible thing. I took several days off from working out (you know it’s bad when that happens) and went into survival mode – as Baya then also came down with the flu. I tried to bike, but it was hard on the lungs, and running also set off coughing fits, and I had to keep the swimming very easy. After about a week and a half of this, I was full-term at 37-weeks, and dilated to 2.5cm. The baby was positioned and dropped. Ready to go, right?! Well one can only hope. You can be like this for weeks actually, so while it’s good that things are progressing in the right direction, it also doesn’t mean a whole lot more than that. (At 38 weeks, I was dilated to 3cm and 80% effaced, baby positioned at -1, and still nothing). So while the lungs are still recovering with the cough and breathing properly, then comes the question of how to get back into it, all the while hoping pregnancy is about done. Mentally, it’s a very strange place to be in. Is it just a matter of trying to push hard for one more week? Or will I go over my due date and I end up having 3 or more weeks to go yet?! That’s a big difference! How do you stay motivated day after day when you’re just ready to be done and move on to the next phase of things? The run has slowed even more for the most part as it has become increasingly uncomfortable with the baby so low in my pelvis. I’ve still been able to do the occasional 4-miler, with my last one being at 38.5 weeks. Last time, I remember several runs where I had to stop because of Braxton Hicks contractions. So far, just once was enough to make me stop from it. I’m looking forward to running pain-free again! The bike – if my lungs can handle it, then my legs can probably too (for the most part anyway!). But even the slight forward bend I’m still forced to have while on the bike can be too much pressure at times still, and let’s face it - a good bike workout NEVER feels good. I was doing fairly well through the 50x50’s, then switched to 100 sprints on 2:10, averaging 3 seconds slower than when I did it during my last pregnancy. So while people keep saying “you’re pregnant, expect to slow down,” I don’t want to be slower than last pregnancy! It seems that I keep slowing down too, as it is becoming more uncomfortable as the pressure increases. Mentally, it’s defeating. It’s good to be nearing the end. *I asked my husband for a couple snapshots of the baby belly at full-term (37 weeks), not sure if I would even want to share them, as I'm uncomfortable bearing so much skin. Ever the artist though, Andy has a gift for making me feel more beautiful than how I perceive myself. So here one is!